Whether you're applying new preferences, installing a new version of your app, or perhaps something more unusual, there may come a time in your life where you say to yourself "I really wish I could automatically restart my application." Your first instinct would be to check the documentation for NSApplication to see if there was an easy-to-use -relaunch: method that would allow you to do this. Failing this — and sadly, this does fail — you might poke around in NSWorkspace, or even some of the LaunchServices APIs, hoping to find something that will allow you to easily restart your application. Alas, despite the fact that the task does not seem complex, there is no built-in functionality in Mac OS X that allows you to restart the current application. The fatal problem with restarting an application is that once your application quits, it loses control: there is no way to perform operations from your application after your application has already exited (it makes perfect sense, it's just a bit inconvenient). Therefore, in order to facilitate an application restart, some outside agent needs to be there to launch the application again once the application has quit; we can't do this without help. LaunchServices, particularly launchd, sounds like a good place to start, since it's a system daemon that facilitates the launching of apps. Unfortunately, LaunchServices is Apple's domain, and we can't just add features to it. For that reason, we will instead create our own one-shot daemon. Here's how it works. When your application receives a relaunch request, it will launch a small daemon within the application bundle. That daemon will then wait until the application quits, relaunch the application, and then quit itself. Relatively straightforward, right? I'm going to assume you have an existing application to which you want to add relaunch capabilities, so we'll assume you've already got an Xcode project ready to go. The first thing you'll want to do is add a new target for your relaunch daemon. 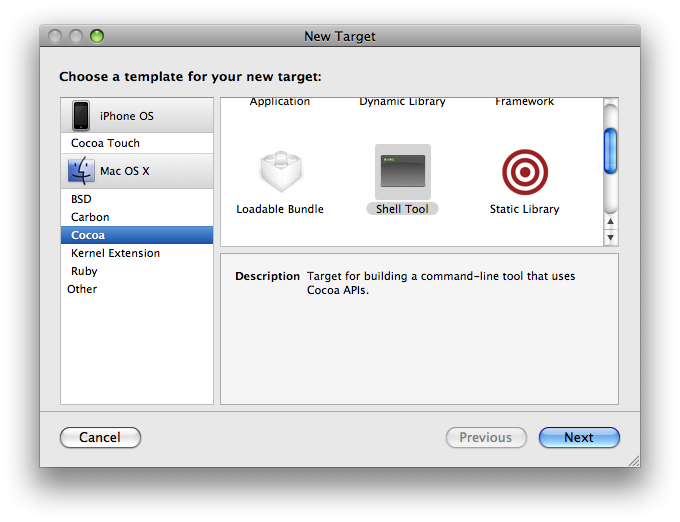 From the Project menu, choose "New Target...", and then under Cocoa, choose "Shell Tool." 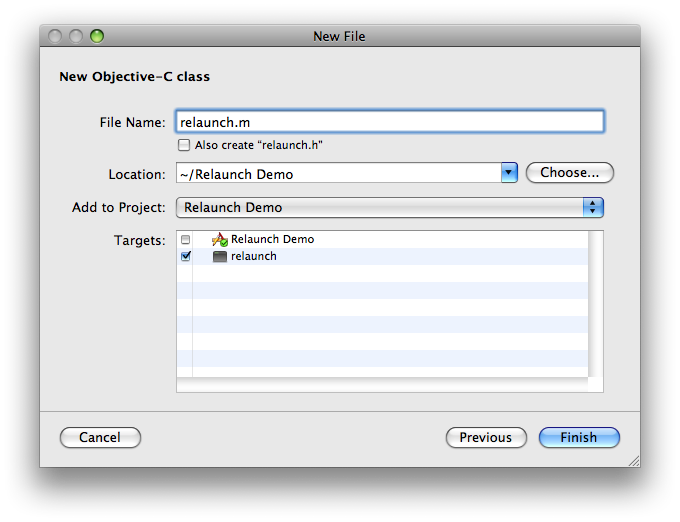 Name your target "relaunch," then click Finish. Expand the Targets group in the sidebar, and double click the target for your application. 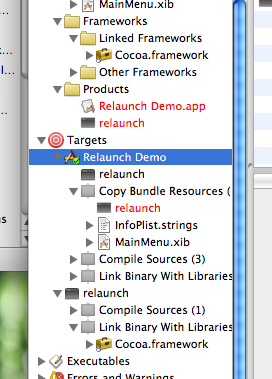 Drag the relaunch target into the "Direct Dependencies" table view on the General tab of the Info window. This will ensure that whenever you go to compile your application, the relaunch daemon will be compiled as well. Since we'll be using Cocoa code within our shell tool, we need to make sure our tool will link against the Cocoa framework. Expand the disclosure triangle next to your relaunch target, and then the one next to "Link Binary With Libraries." If by some chance Cocoa.framework is already listed there, you're all set, but most likely it won't be. From the Frameworks → Linked Frameworks group (above), drag the Cocoa.framework entry down to the "Link Binary With Libraries" group under your relaunch target. This will allow you to use Cocoa code. (Note that you can also drag in the framework from /System/Library/Frameworks/Cocoa.framework, but this is a bit faster). Since this application will be running without a run loop, we need to create an autorelease pool, as is standard procedure with non-app Cocoa projects. // blah blah blah, more code! You'll notice I added a one-second sleep into the project. This is just to ensure that the application has indeed quit before we attempt to launch it again. Depending on how long your application takes to terminate ordinarily, you may want to increase this to two, three, or even more seconds. We're going to assume that the path to the application we want to launch was passed in as the first command line parameter to our relaunch daemon, so we'll obtain an NSString from that using NSString's +stringWithCString:encoding: method. Once we've got this, we'll use NSWorkspace's -openFile: method to launch our application, making sure to call -stringByExpandingTildeInPath on our path in case we're provided a user-relative path. Finally, we return, draining our autorelease pool and the process, and using the success of the application launch to return either 0 (success) or 1 (error). The next order of business is creating our NSApplication category. For this, I once again use the Objective-C Class template (with header file, this time). 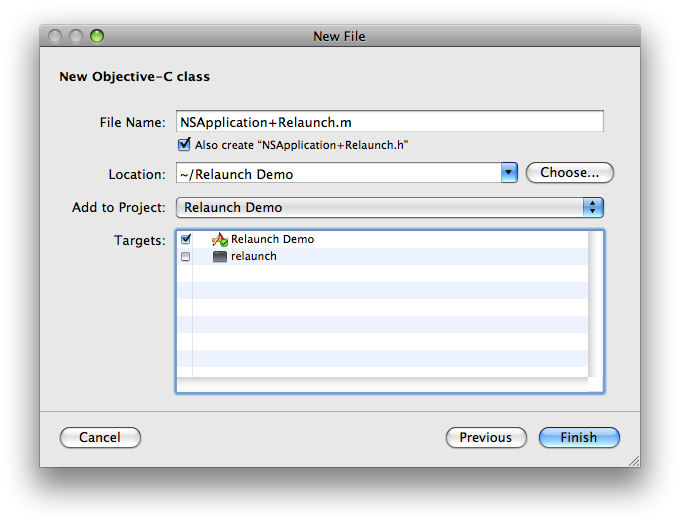 Create a new file called NSApplication+Relaunch.m, and make sure you add it to your main application target this time, not your relaunch tool. Modify your header to specify instead the interface for a category called Relaunch, and add a signature for a method called -relaunch:. You may also consider adding a preprocessor constant (which I chose to call NSApplicationRelaunchDaemon) that maps to the name of your relaunch tool, making it easy for you to change this in the future. You can, of course, opt not to do this, but it's at least somewhat good practice. And for most basic purposes, that's really all there is to it! Calling the relaunch: method of NSApp will begin the relaunch cycle. Now while this will be sufficient for most uses, this implementation does ignore a few concerns, particularly what happens if your application displays alerts or requires subsequent user interaction in order to terminate (ie, an unsaved changes warning for document-based applications). Since most users do not have ninja-like reflexes, it will likely take more than one second for them to respond, meaning the relaunch will fail. Even if you increase the delay, it will most likely cause problems — in general, it's totally impractical to use the above solution if there exists a case in which your application would not quit immediately. In order to combat this, we're going to take a cue from Sparkle: get the PID (process ID) of the application, and wait until that process ends before relaunching the application. This eliminates our need to use sleep(1), and also clears us for use in almost every use case. Our relaunch daemon will now wait until the main application finishes terminating before relaunching the application. Relaunching an application isn't difficult, it just requires a bit of ingenuity. Using the code snippets above, you'll be set to automatically relaunch your application in just about any situation. The only time you may need to modify this code is if you're restarting in order to install an application update: in this case, you'll want to copy your relaunch daemon to a temporary directory before launching it, and then instruct the daemon to delete itself before exiting (another tip from Sparkle). Per usual, I've packaged the code in this tutorial into an Xcode project and NSApplication category that you can use in your own application. I've also included a pre-compiled copy of the relaunch daemon, so all you really need to do is add the relaunch tool to your app's Resources directory, and import the NSApplication category — no need to bother with the relaunch source/target/etc. unless you want to. Happy relaunching!